Lawmakers want to hear from the top executives of a private, for-profit jail operator that’s been the subject of a year-long WFAA investigation detailing a series of problematic deaths and how the company uses a loophole to employ large numbers of inexperienced guards. The decision to call executives of LaSalle Corrections to testify before the House County Affairs Committee came during Thursday during a hearing on a bill proposed by Rep. Bill Zedler, R-Arlington, that would tighten up a rule that allows jailers to work under a temporary license for up to a year with no training required. Zedler filed the bill as a result of the WFAA investigation. Copies of the stories were provided in the packet provided to lawmakers. 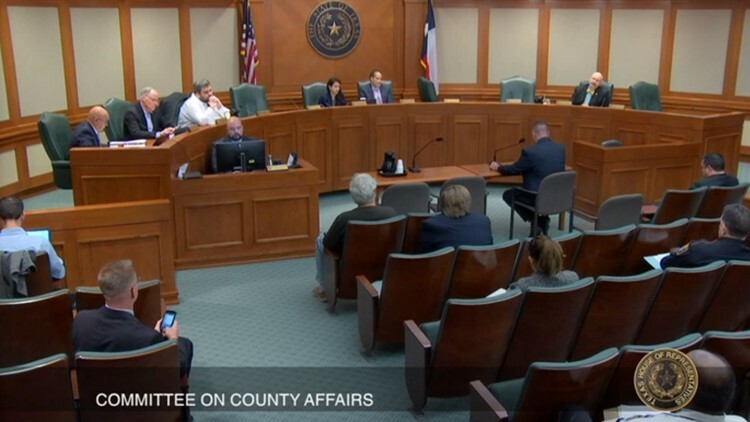 The Texas House County Affairs Committee hears testimony on LaSalle Corrections jail deaths during a debate March 28, 2019 in Austin on proposed new jail guard training rules. Rep. Garnet Coleman, D-Houston, who chairs the committee, said he would subpoena LaSalle’s executives if they refuse to willingly come testify next week. The company runs jails in Parker, Johnson, Bowie and Fannin counties, and several others in Texas. WFAA has requested comment from LaSalle. They have not yet responded. Zedler’s legislation, if adopted, would require that within 90 days of being hired, all county jail guards -- not just LaSalle's employees -- complete training and pass a state exam. Rep. Yvonne Davis, D-Dallas, also filed legislation as a result of WFAA’s investigation. Her legislation is tougher: it would require that jailers complete the state-mandated training and pass the state exam before starting to work in the jail. 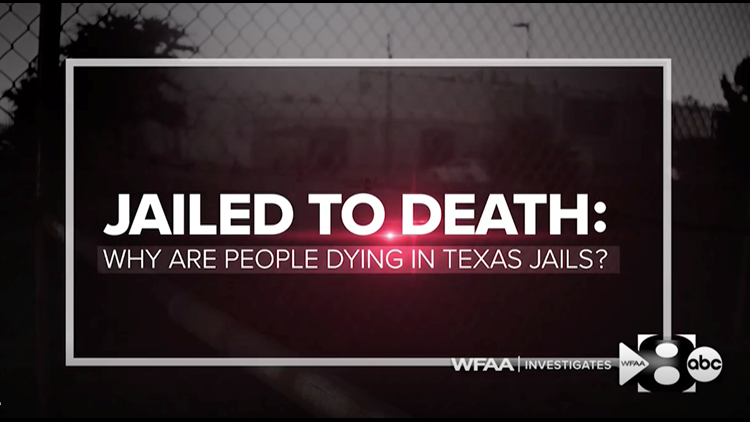 The WFAA investigation detailed the troubling deaths of two inmates – Michael Sabbie and Andy DeBusk – that involved inexperienced guards who only held temporary licenses at the time the inmates died. Graphic videos show the confrontations both men had with LaSalle jailers. Sabbie was found dead on the floor of a Bowie County cell of a heart attack in 2015. The guard who was supposed to be checking on him had only been on the job three weeks and held a temporary license. In DeBusk’s case, guards in Parker County's jail, also run by LaSalle, repeatedly placed their knees in his back as he screamed that he couldn’t breathe. His face was gray and covered in vomit when jailers left him inside a cell. It was too late for anything to be done by the time jailers realized he was in distress. “If they had done what they were supposed to do, my son … would still be alive,” his mother, Diane Wallace, told lawmakers at Thursday's hearing in Austin. She was one of two mothers of prisoners who have died in LaSalle’s jails to make an impassioned plea for lawmakers to tighten up the training rules for county jailers. The other mother, Jennifer Houser, told lawmakers how her daughter, Morgan Angerbauer, died in the Bowie County Jail from a diabetic coma after her pleas for help were ignored by jailers and a nurse. “Neither LaSalle Corrections nor Bowie County provided any meaningful training about how to care for seriously ill detainees,” Houser told lawmakers. On the night Angerbauer died, more than a third of LaSalle’s jailers held temporary licenses, according to state licensing records obtained by WFAA. One former Parker County jailer told lawmakers she’d been on the job just a week at the Parker County jail when an inmate tried to hang himself. “I had no clue how to handle that situation,” Julie Barnes told lawmakers. Barnes said her initial training consisted of a few days of watching videos and a few more days of shadowing other jailers. She said it left her unprepared to deal with that situation and many others that she confronted. “Jailers do not know how to handle themselves in these situations,” she said. Barnes told lawmakers she worked as a jailer for eight months at the Parker County jail before LaSalle put her through the state-mandated training. She told lawmakers that training was also desperately inadequate. Defensive tactics, for example, was taught from the book rather than actual hands-on training, she said. “At no time in my two years at the jail was I taught how to protect myself,” she said. Barnes reached the rank of sergeant. She worked for LaSalle for two years before leaving to take a job as a probation officer. She told lawmakers the legislation was a “step in the right direction” but more needed to be done to ensure jailers received the proper training to do their jobs. Speaking in opposition to the legislation were representatives of the sheriff’s association and county sheriff’s departments who said a 90-day rule would place an undue hardship on their departments. “If a temp jailers license were to expire in 90 days, it would put a significant burden,” said Terry McCraw, administrator of Collin County’s jail. Tiffany Witherspoon, the jail administrator of Robertson County, told lawmakers it would be “great hardship” for sheriff’s departments particularly those in rural areas to put new jailers through the state-mandated course because they have to send their jailers long distances for the training. Under current rules, the Texas Commission on Law Enforcement, or TCOLE, gives newly-hired county jailers a year to complete a basic county jail course, which consists of a 120-hour program that teaches, among other things, how to handle unruly prisoners and how, and when, to use force. There are currently about 25,000 county jailers in the state of Texas. Of those, about 2200 are working under temporary licenses, or about 9 percent of the total. A new WFAA analysis of state licensing records shows there are currently six counties that run their own jails – Haskell, Karnes, Brewster, Limestone and Dallam and Terrell – where 50 percent of more of the jailers are working under temporary licenses. In another two dozen other counties, the number of jailers with temporary licenses exceeded a third of the jail’s staffing. The new analysis found that at LaSalle’s Bowie County jail, 29 percent of the jailers held temporary licenses. At Johnson County, it was 42 percent; 25 percent at Fannin County; and 24 percent at Parker County. Kenny Merchant, who oversees credentialing for TCOLE, told lawmakers that he was aware of jails that had taken advantage of the temporary licensing system and treated it was a revolving door. He described instances where jailers worked for a year under temporary licenses, took a one-year hiatus, and then returned to work again at the jail under another temporary license. Lawmakers were clearly distributed about what LaSalle’s practices and questioned the state top jail regulator about it. “I’m just wondering how to these people stay in business,” Rep. Dan Huberty, R-Humble. Brandon Wood, executive director of the Texas Commission Jail Standards, responded that LaSalle runs a business and operates on “profit margins.” He also told Huberty that when problems are found, the company’s jails are issued notices of noncompliance. Lance Lowry, a correctional expert, reminded lawmakers of the heavy price that was paid following the 2015 suicide of Sandra Bland in a Waller County jail cell. “This occurred because jailers weren’t properly trained to address mental health issues,” he said. Lowry reviewed the DeBusk and Sabbie cases at the request of WFAA. He has said it was clear from watching the videos that the jailers were not properly trained. Chris Jones, training coordinator for the Combined Law Enforcement Association of Texas, drew a parallel for how training used to be done for police officers. He said decades ago, a police officer could be hired in the state of Texas, given a badge and a gun and put out on the street with little to no training. Today, police officers undergo months of training and have to pass their state-mandated licensing exam before they can work as officers. He said jailers likewise should have to complete state-mandated training and pass the licensing test before being allowed to work as jailers. “By God somebody is going to get hurt,” he said. “It’s pay now or pay later,” he said. The bills filed by Zedler and Davis remain pending in committee.